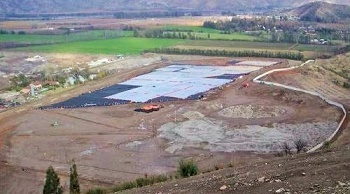 Also known as landfill cap covers, daily cover for landfills can be crucial to the health and safety of the environment and often required by law. While 6 inches of soil are traditionally used for the daily cover, many states allow for the use of alternative daily covers, including geomembrane covers. A geomembrane cover manufactured from a synthetic reinforced polyethylene is far more efficient and safer to use than other alternative daily cover materials, such as shredded paper or shredded rubber. They are reusable, give you a real cost savings. They offer straightforward installation, by hand or by equipment or a combination of both. They add no additional layer of uneconomic material to the waste, preserving the usable life of the landfill. Adding no compression or sealing, they allow the freest movement of generated gases through the waste, for greater potential generation of energy. They likewise do not inhibit leachate moving through the waste mass to the collection layer. At Western Environmental Liner our geomembrane landfill covers can be manufactured with different attachments around the perimeter, including D-lines, grommets, or triangles that can be used to attach ropes or seatbelt webbing to tie the covers down. We started as a tarp manufacturer, and we’ve never forgotten that covers need to be tied down. For landfill daily covers we usually recommend our high quality Aqua series of Reinforced Polyethylene (RPE). We are one of the largest providers of RPE in the world, and our Aqua series line offers excellent tear resistance and makes for an excellent tarp or cover. We can manufacture a landfill daily cover to meet your specs. Contact us for a quote, or read our blog post to learn more about the advantages of using a geomembrane as an alternative daily cover.